Lincoln 1 about to load for a tour. 1902 Oldsmobile runabout and 1904 Cadillac Tonneau on display alongside cars from the Museum. 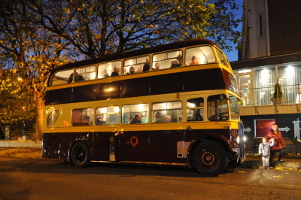 York 64 on the 'twilight tour'. A foggy start to the morning was followed by bright autumn sunshine for our 'end of season' Open Day event on Sunday 1 November. 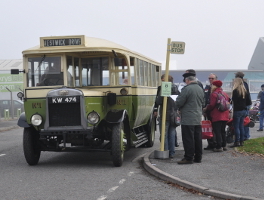 For the third year running, a new record was set for visitor numbers, with 1,100 paying visitors through the door of the Museum that was filled to capacity with sales stalls, and a steady flow of visitors to the refreshment stand  a record quantity of cakes and rolls (600!) was sold out by the end of the afternoon. 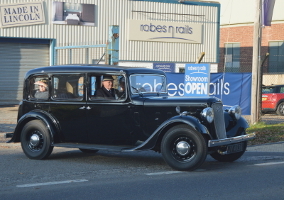 Seven of the Museum's cars took to the road and were kept busy offering rides  this included the 'black 10' (VL 8960  1937 Austin 10 'Cambridge' Saloon) which received attention and an MOT test before the event after nearly 10 years off the road. 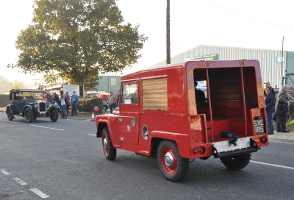 Our 1928 Austin 12 and 1961 Austin Gipsy Our 1937 Ford V8 shooting brake was one of the cars giving rides. Guest bus SVL 830R, 1977 Lincolnshire Road Car Bristol LH was one of the buses in service. 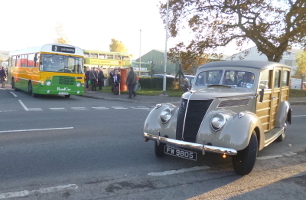 Our 1936 Austin 18 was one of the cars offering rides at the event. 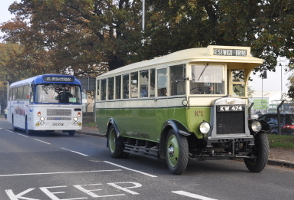 Forty-one buses and coaches were in action on the free bus services, offering a frequent service to the City Centre, a service to the Natural World Centre at Whisby, the park & ride at Teal Park, excursions, and extra journeys to the static bus display, which due to the continuing growth of the event, was relocated to Lindum's site on Station Road. 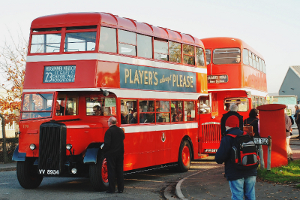 The buses ranged in age from our 1927 Leyland Lion to Delaine Buses' September 2015 Volvo B5TL, and in scale from our Chevrolet coach to our 85 seater Lincoln Olympian, and 12 metre Seddon Pennine coach MSF 750P, new to Eastern Scottish for London express services. 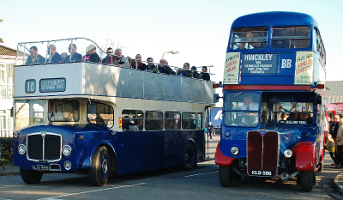 Among the vehicles making its debut at the event was the event's first scheduled open top bus, Grimsby Cleethorpes 133 (1960 AEC Bridgemaster) which has recently been acquired by one of our members and returned to the County. 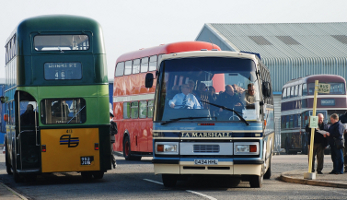 A record number of bus departures were operated by this fleet, and healthy loads were carried. 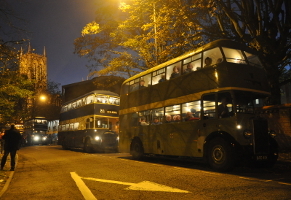 Our traditional 'twilight tour' at 5pm again needed 4 double deckers. 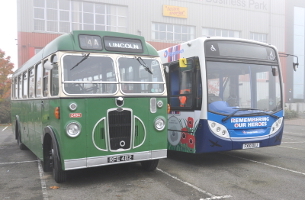 Two visiting buses from our friends at Stagecoach in Lincolnshire - 1961 Bristol SC RFE 482 from the heritage fleet, and FX10 DUJ, Alexander Dennis Enviro 300 wearing special livery for Remembrance Day. 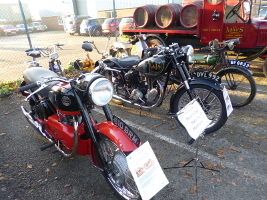 Our 1960 Velocette Viper, 1950 AJS 18S and a guest motorcycle on display. 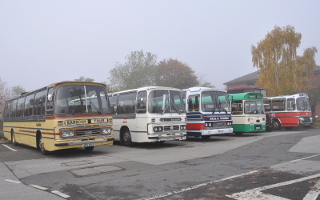 Some of the visiting buses and coaches on display. 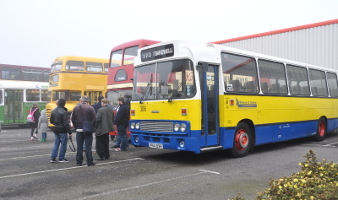 Around 40 visiting 'static' buses and coaches also came to the event, including Stagecoach Lincolnshire's 'poppy bus' marking November's Remembrance events. 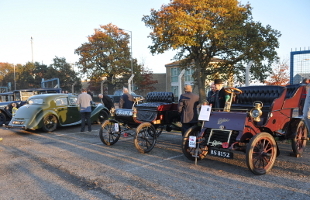 Among the guest cars on display were two of Larry Riches' veteran cars, a 1902 Oldsmobile runabout and 1904 Cadillac Tonneau. 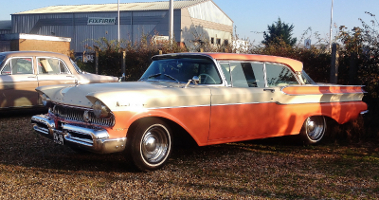 These photos - and more - can be seen in higher resolution on our Facebook page. Also, thanks to our neighbours at Anglo Steel, Fixfirm, Greens Engineering, Hillcroft Business Park, Krystals, Lincolnshire Co-operative, Nexon, Robes & Rails; Lindum on Station Road and Siemens at Teal Park for their help in allowing use of their premises for the day; to F Troop & Sons of Leadenham for generous sponsorship of the programme, and to Stagecoach Lincolnshire for their continued support. 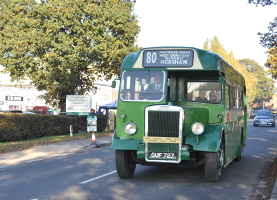 All funds raised will go towards the running of our open days and upkeep of the Museum and vehicles. Ken Jones (Flickr) - many thanks for the use of some photos from this collection. If we you would like us to add your collection / video(s) to this list, please get in touch. 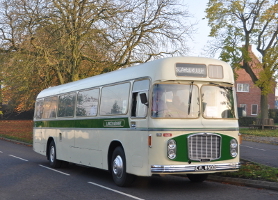 Report and pictures from past open days - Easter 2015 - November 2014 - Easter 2014 - and some videos of past events on YouTube can be seen here.